Nicola Morris was born in Kenya to an English father and Irish mother. She draws on a rich family history that can be traced back to the court of Henry VIII, the breweries of Lancashire and farms of Yorkshire to Cork city publicans and a mysterious Italian great great grandmother. She grew up in Dublin city and obtained a degree in History from Trinity College Dublin. In 2007 Nicola became a director of Timeline Research Ltd.
She works very closely with the production company for the BBC programme ‘Who Do You Think You Are?’ and has researched families for the UK and US series as well as appearing on screen with Jeremy Irons, Graham Norton and Chris Moyles. She has also appeared with John Waters in ‘Where Were Your Ancestor’s During the Famine’. 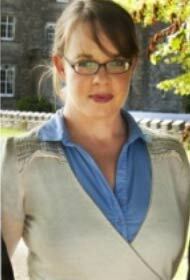 Nicola is also working with Big Mountain Productions on a number of historical and genealogical related programmes. Her article on life in the Dublin Slums was published in the BBC Who Do You Think You Are? Magazine, along with a shorter guide to tracing your Dublin ancestors. She has also written a history of the Fulbright Commission in Ireland.